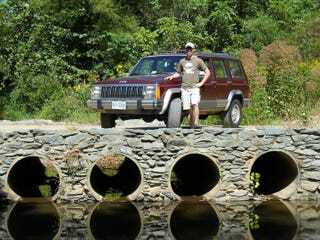 In my head, the tale of me and my Jeep is a love story. It’s about a young, naive boy who just got to college and knew nothing about wrenching. It’s a story about a Jeep that taught the boy more than any textbook ever could. It’s a coming-of-age story. It’s a story about how buying one car changed my life. It all started in the fall of 2009. I had just flown to the east coast for the first time to attend a university I knew very little about. My dad was at war in Afghanistan, I was having trouble maintaining a long distance relationship, the kids I met in my freshman (first year) dorm were bullies, and life just sucked. Something had to change. Fast forward a year, and you’ll find me surfing Craigslist for a car. Unfortunately, my dad told me I couldn’t have a car. “Public transportation is good in Charlottesville, and none of your brothers had a car in college,” he said. He had a point, but I loved cars, so I went and bought one anyway (though I’m usually not one to disobey my parents). I searched through my funds, which I had obtained via my grocery bagging job back in Kansas, and came up with 1400 smackers. That was my top dollar. Now it was time to find a whip. We met in the stadium parking lot. The sellers were a funny lookin’ pair of dudes, probably in their thirties. One guy was extremely large, and the other guy was short and skinny. I couldn’t help but find the contrast between the characters rather humorous. Anyway, they were definitely country folks (read: thick southern accents, camo garb), and the car was being used as a pizza delivery car- not exactly “highway miles.” She had some rust on the rocker panels, and the driver’s seat was permanently deformed thanks to the rather enormous previous owner, but it didn’t matter. It was love at first sight. The big guy threw me the keys, and as we took her for a test drive, I realized that he knew nothing about the car. He didn’t know if it had an exhaust leak (it did), he didn’t know it had cruise control, and he knew nothing about the service history. Not to mention, the key came out of the ignition while driving. All of these signs should have signaled: “Stay away, David. RED FLAG!” But they didn’t, because I was smitten. Long story short, I got the seller to come down from $1900 to $1400, and life was good. Or so I thought. I had no tools. I didn’t know why the heck my oil pressure gauge kept moving when I accelerated. Why did the car sound like a freight train? Why was the power steering making lots of noise when I turned? I remember calling my mom, telling her I had probably made a grave mistake. My dad was none too thrilled about my purchase, since he forbid me from buying a car in the first place. In time, though, I think he saw the passion and ultimately didn’t hold it against me. I told him I needed a car for two reasons: First, I was the president of the car club which I had just founded, and wanted to take the group on trips to IIHS, the DC Auto Show, car meets, shops, etc. Second, I was starting to do research at an automotive safety lab, which was 10 miles from campus. I wasn’t lying. These were indeed reasons why I needed a car, but I think, ultimately, I just wanted something to hoon. The car needed work. The valve cover was leaking, the exhaust pipe was shot, the rear bumper was pushed in, the fuel pump was on its way out, and power steering fluid was leaking. How was I going to fix all this? What if I broke something? What are all of these wires and hoses in the car? What in the hell is a crankshaft position sensor? Seeing as I was a total noob, the first thing I did was contact the car club at our neighboring university, James Madison University. This club was big, and the members were handy with a wrench. They taught me to change the valve cover gasket, spark plugs, oil, and air filter. Having someone experienced teach me how to handle a wrench was great, and gave me confidence in my future mechanical endeavors. From then on, if I wasn’t studying for an exam, I was wrenching. I wrenched in the streets, in parking lots, in parking garages- wherever I could. I remember swapping a fuel pump in the Emmet-Ivy Parking garage. I was underneath my Jeep late at night when a few girls asked me what I was doing. I told them I was swapping a fuel pump. “Take a break,” they said as they threw me a bottle of beer. So I chilled with these girls from Florida who were visiting to see a Blake Shelton concert. It’s funny, they asked me if I knew a good place to party and if I knew a place where they could crash for the night. But my mind was focused squarely on my Jeep. Keen to get back wrenching, I just responded with “beats me.” I told my friends about this, and they slapped me on the back of the head. When I learned something new, I taught the members of my car club at our weekly meetings. In fact, one day, I was teaching the club how to do an oil change. I asked one of our members to spin on the oil filter. When he was done, I grabbed the oil filter, and it seemed like it was on there pretty tight. We filled the 4 liter with 6 quarts of oil and I cranked her up. That’s when I heard the whole club yelling “CUT IT! CUT IT!” Apparently the filter had been cross-threaded and the Jeep dumped the oil all over the stadium parking lot. That poor kid who tightened the filter was scarred for life and will probably never do an oil change himself again. A real shame. But a funny story nonetheless. The car was deemed totaled by the insurance company. But instead of having them take my Jeep, I took their $1600 and kept the car. I then spent the next few months fixing it. I distinctly remember riding across campus on my bicycle holding a front bumper on my lap, getting the strangest looks. I had a front fender and a header panel outside my dormitory being spray-painted. Among the many rich, preppy students at UVa, I was a complete oddball, constantly covered in oil and grime. But I was okay with that. While I helped the Jeep by maintaining it, the Jeep helped me in a lot of ways, too. It got me through some pretty tough times in college, as it quickly became my pride and joy- a way to forget about the stress. It also helped me learn problem solving skills. I had to learn and understand the entire mechanical/electrical system to properly diagnose and correct faults. If something broke, I had to know what caused it, how I can fix it, and how I can prevent it from happening again. This kind of critical thinking has paid dividends in the years since college. Wrenching on that Jeep also benefited me in unexpected ways. Not only was I now comfortable fixing pretty much anything, but when the time came to apply for internships, I had some luck. It turns out that engineers who can handle a wrench are in short supply and in high demand. I told employers about my struggles with my Jeep, and they loved it. I was hired as an intern for Cummins, then hired full time for a Detroit-based automaker (it wouldn’t be hard to figure out which one based on this story). The Jeep sits at 245,000 miles now and still runs and drives like new. I installed a 3.5” lift kit on it and some 31s, and plan to “wheel” her in Moab one of these days.